The Cape Pilots Club had great weather for their 1st Annual Chili Cook-Off Competition on the 11th of this month. I understand that Donna Irwin's entry took first place. Congrat's to Donna! Unfortunately, I wasn't able to get a photo of her and her award...if any Pilot's Club member was able to get one, perhaps they could post it in the "Your Photos" section. 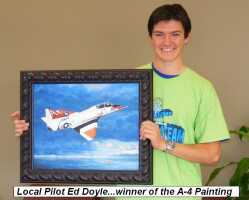 One of our local pilots, Mr. Ed Doyle held the winning raffle ticket for the beautiful painting of our A-4 Skyhawk...courtesy of artist Mary Russell. I didn't have info on the number of visiting airplanes and their home bases, but know that at least one flew down from St. Louis to join in the fun. At one point, I took advantage of the party atmosphere to sneak along the back wall and steal a large cup-full of Chili Entry # 6 (which turned out to be Dan Russell's creation). I almost got away, but was caught and offered a drink to go! Figuring on knocking off the chili as I fueled and shuffled airplanes on the ramp, I passed on the soda, and climbed back into my truck. Chugging a gulp of the chili as I headed across the ramp, I was rewarded for my thievery with tears and a brutal clearing of all my sinus passages! Dan REALLY likes to load his chili with spices! Still, it was good stuff, and I managed to finish it before it destroyed it's styrofoam coffee cup! I've posted a few photos of the various aircraft that attended the Fly-In. All photos are courtesy of Lineman Mark Perry.